The 15” HD touch screen interactive display on the Star Trac E-RBe recumbent bike allows the user to plug in an iPod or connectivity with music and videos. This state-of-the-art entertainment system is the top-of-the-line in home recumbent models. The Star Trac E-RBe recumbent bike console can charge your media devices in the USB charging station while you workout. The screen shows your workout time, heart rate, calories burned, calories/hour, watts, distance, RPMs, and speed. It also has a course profile and ¼-mile motivational track. The Star Trac E-RBe recumbent bike has a custom aluminum frame, one-piece crank with sealed bearings, and dual-sided pedals with strap and skate-style clips. The walk-through design allows for easy on/off, and other standard features include personal cooling fans, an adjustable reading station, armrests, wrap-around seat adjustment, and wireless heart rate control. There are heart rate pulse sensors in the handlebars as well. With 20 levels of smooth resistance and 15 programs, you will enjoy hours of low-impact cardio exercise on the Star Trac E-RBe recumbent. The pre-programmed workouts feature Dynamic and Constant heart rate control, quick start, manual, Watts, Auto Pilot, Fitness Test (Modified Astrand-Rhyming Test), and three custom workouts. The 15" high definition touch screen display has iPod® connectivity to watch or listen to media content. The entertainment system features a NTSC/ATSC/QAM digital tuner or PAL/SECAM tuner, integrated iPod® connector, USB power port, and a coaxial cable connector at the base. Channel and volume controls are intuitively placed on the touch screen display. There aren’t many exercise bike reviews on the E-RBe since most users aren’t crazy about paying so much money for a recumbent. But you should note that the Star Trac E-RBe recumbent bike is one of the longest recumbent models at 66" and the heaviest, so expect the ride to be very stable, with a pedaling motion that is smooth and quiet. The Star Trac E-RBe carries a big $4,999 price tag (MSRP: $5,795), which is a lot even for a commercial recumbent bike, yet this one is sold for home use. 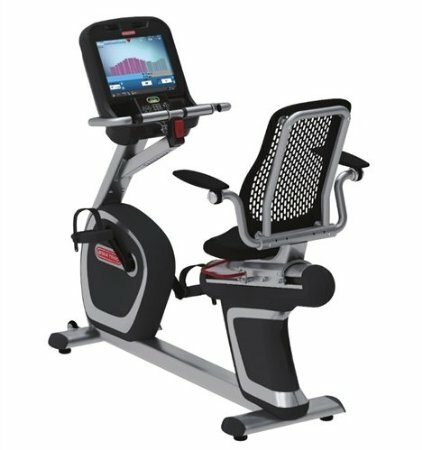 For a more affordable alternative, check out the Life Fitness LifeCycle Platinum Club Series Achieve Recumbent, which also has a 15" LCD touch screen, for around $3,400.